This checklist goes through the steps needed to make a new ASF project for Atmel ARM Cortex microcontrollers, which files to modify and how to add ASF modules to a project. The list is intended as a quick reference for starting new ASF projects. Atmel Software Framework supported devices and latest documentation can be found on the Atmel ASF website. The following steps are also available as a handy downloadable pdf file from startingelectronics on GitHub. The pdf file can be downloaded, viewed or even printed and used as a reference whenever a new ASF ARM project is created. Open Atmel Studio and start a new project using File → New → Project... from the top menu bar or Ctrl + Shift + N on the keyboard. 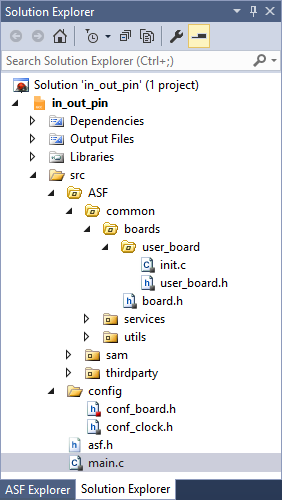 In the New Project dialog box, select GCC ASF Board Project, give the project a name and select the project location. In the Board Selection dialog box enter the ARM microcontroller part number in the search field and then select User Board template for the desired microcontroller. Open the ASF Wizard using ASF → ASF Wizard from the top menu bar or Alt + W on the keyboard. Search for clock under Available Modules in the ASF Wizard. Select System Clock Control (service) and then click the Add >> button. Click the Apply button to add the selected module. Use Solution Explorer (image below) to open src → config → conf_board.h and add definitions for the clock resonators and oscillator start-up time, e.g. Without these definitions the compiler will issue several warnings. Use Solution Explorer to open src → config → conf_clock.h and comment out and uncomment the definitions to select the desired main clock source and settings. Use Solution Explorer to open src → ASF → common → boards → user_board → init.c and add board specific initialization code in the board_init() function in init.c, e.g. code to disable the watchdog timer, code to set the pin direction of GPIO pins defined in conf_board.h, etc. In the above code example, the IOPORT – General purpose I/O service (service) ASF module must be added to the project to be able to call functions starting with ioport_ in the project. Finally the application code for the project can be written.